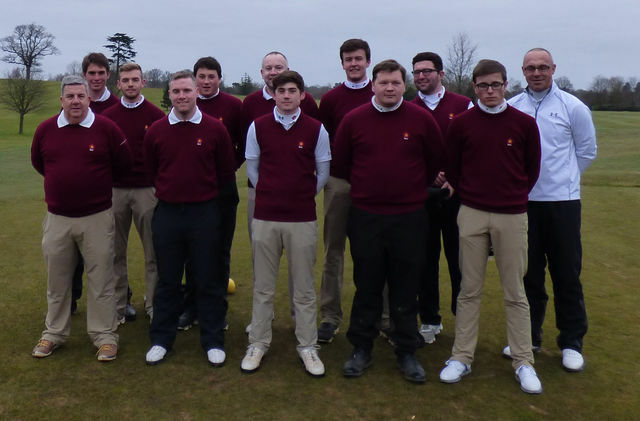 The 2016 season gets under way for the Northants Golf teams with a 10 a side friendly match against Warwickshire, with the 1st team were played at Overstone Park on Sunday 20th March. The news was that we were starting on the 10th hole and with hedgehog wheels only, the players had a choice of a pull trolley or carry, also, we were playing off the yellow tees. Match 1: In an quality match, with both pairings playing well, birdies on 6 holes on the spin from one or other side, an honourable half was the deserved result. Match 3: Taylor and Sam teamed up and ran out 1up winners. Match 5: Graham Bott and Jack Brown combined their respective strengths and overpowered their opponents and ran out comfortable winners 6/4, great to see these two back and playing well. This left us all square at 2.5 each at Lunch. Match 1: Callum Farr took on a strong Pat Ruff and in a quality battle, it came down to the last hole, which awesome Callum won with a birdie to win 1up. Match 2: Harry Woan took on England prospect Max Martin, Harry battled hard in another high standard game but unfortunately lost on the last to an Eagle 3. Match 3: Jamie Milligan wasn't quite with it in his match against Liam Phipps, with his mind really on turning pro, Jamie lost 6/5. Match 5: Miles Mudge took on Dale Marsen, he showed some great signs of "brushing off the rust" but not quite enough, losing 1 down. At this stage, as the players came through the 11th hole, it looked very tight and had the match ended there, it would have been all square and after match 8 finished, with match 10 a walkover to Botty, it looked like we would need something from our last 2 players. Match 9: Jack's short game is always a pleasure to watch and it must be so demoralising for his opponents to see him get up and down from impossible positions, Jack running out eventual winner 2/1 against the Warwickshire skipper. Match 10: Botty played Gary Greenway, who had a reoccurence of a hand injury after 4 holes and couldn't continue, it was a shame as Graham was playing well and would have liked the opportunity to prove his return to form. Overall, a great start to the season, Warks are always a strong team, let's carry this forward to a successful season. As usual, the team spirit amongst our lads is fantastic to see and is worth a couple of points each match, long may that continue.